Nearly everyone has been on a weight loss regimen at some time in his or her life, and many people have experienced the full panoply of approaches to weight reduction, from starvation to pills to cabbage soup. Fat is a multi-billion dollar business, and therefore, we are constantly hearing about the latest “guaranteed” or “miracle” weight loss plan or product that can be ours if we are willing to part with some of our hard-earned money. There are also the old standby weight loss plans that have been around for decades, and which periodically reinvent themselves to satisfy current trends. The truth is that nearly everyone who has tried one or more of these plans has lost some weight—perhaps even a lot of weight. It is also true that most people who go on a diet and lose weight, end up going off the diet and gaining the weight back—and often, they gain back even more than they lost. Although many weight loss plans actually have some scientific and clinical merit, are they the best answer to our weighty dilemma? Most weight loss products and plans include the requirement that you eat sensibly and exercise. I have researched a number of "fad" diets, and inevitably, they include a regimen that would cause you to lose weight regardless of whether you purchased their product or plan. So, if you have to eat less and exercise more for the product to work, why not try doing that WITHOUT buying the product or plan and save yourself some money. Of course, there are plans that offer group support, behavior modification techniques and sound nutrition information, and these actually may be helpful. Nevertheless, the warning "Buyer Beware" has particular relevance with regard to weight loss gimmicks, since it is so easy to take advantage of desperate consumers. Is there a secret diet plan for weight loss? If there is a universal secret to losing weight and keeping it off that works for everyone, I do not know what it is. We are all individuals with varying genetics, metabolic rates, body chemistry, taste buds, lifestyles, access to the food supply, psychological profiles, etc. etc. etc. Another way of saying this is that what may work for one person, will not necessarily work for everyone. I once heard a weight loss “expert” say that when she wants a treat--say a cookie--but doesn’t want to spoil her diet, she just eats half of the cookie and saves the rest for later. Although this may work for some people, it is probably not helpful to those who are thinking in terms of the whole box of cookies. Even scientists and health experts can’t agree, and are often diametrically opposed about the best way to lose weight. If you throw a few charlatans and some well-meaning-but-misguided diet gurus into the mix, the result is at best,confusing and expensive, and, at worst, dangerous to your health. My purpose here is not to discourage you, but to provide some solid, useful information.You don’t have to be a victim of the latest weight loss scheme or scam. Armed with knowledge and common sense, I hope it will become easier for you to decide what is the best way for you to achieve your healthy eating goals. Research into the science of weight loss is ongoing, but here are some things we do know so far. Fat cells are the culprits! Fat cells--that is the cells that store fat in your body--have two components that affect how fat you are—the number of fat cells and the size of the fat cells. The number of fat cells in your body was mostly determined during your growing-up years. However, that number may still increase even after you are an adult--if your existing cells fill up and your body needs new places to store fat. It's kind of like adding new cupboard space in your kitchen, because your existing cupboards don't have any room left to store all of the groceries you buy. You may have to push out the wall and expand the size of your kitchen to accommodate the new cupboards. In the same way, your body expands to accommodate the new fat cells. The size of the fat cells changes based on how much fat there is to store. When you lose weight, your fat cells shrink, but they do not go away. This means that if more fat storage is needed, these cells are readily available to provide that storage room. Perhaps this is why those of us who have lost weight need to be more diligent than naturally thin people—because we have more fat cells just waiting to be filled up! Is your body working against you? There is some evidence that the enzymatic activity in existing fat cells may actually work against you after weight loss, by sending signals to your brain that you need to eat more so that your fat cells can fill up again. That is, for a time at least, until your body adjusts to your new weight, you may find it more difficult to eat less. This is your body’s way of trying to maintain the status quo, even if the status quo is not fashionable or even desirable from a health standpoint. Can your organs get fat? Unfortunately, fat can also be stored in places that are not designed for such a purpose, such as your heart and liver. This kind of fat storage can lead to organ malfunction, disease and even premature death. If you follow the news, you have probably heard about the discovery of an “obesity gene” which directs the action of leptin, the protein that seems to affect appetite and how your body uses energy. However, injections of leptin only seem to help those rare persons who have a genetic deficiency of this protein, so this discovery probably has few implications for the average person struggling with weight loss issues. There is a gremlin in the physiological weight loss maze--a protein called ghrelin. It is ghrelin that signals that it is time to eat. It is also ghrelin that wants you to maintain your body weight as it is. If your ghrelin levels are low, you are probably not hungry and if they are high, you may feel like you could “eat a horse!” When calories are severely restricted, such as in extremely low-calorie diet plans (or what they used to call “crash diets”), the ghrelin level in the body rises, making it difficult to stick to the regimen. “Feed me, I’m hungry,” says the ghrelin gremlin! What do nutritionists say about diet plan for weight loss? For years nutritionists have told us that our weight is a direct result of our “energy balance.” That is to say that if we take in more energy (in the form of calories) than we expend, our body will turn the excess calories into body fat and we will gain weight. The energy you take in is in the foods you eat. Carbohydrates, Fats and Protein can all be converted to body fat, so the theory is that if you eat more of these caloric foods than your body can use, you will gain weight. Based on this theory, for every 3500 extra calories you take in, one pound of fat is stored somewhere in your body. Although this sounds like a lot of calories, the effect is cumulative, so that if you eat only 100 extra calories each day (an extra banana, perhaps) you will gain 10 pounds each year. Even if you only eat an extra 100 calories a week, you could gain 75 pounds over an average lifetime. 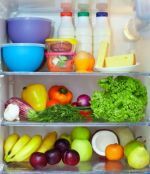 Although the concept of energy balance is certainly part of the puzzle, and probably a good basis for thinking about weight management, it does not seem to completely address the issue for everyone. The problem is that it does not address the complexity of food intake and energy output or the wide variety of factors that may affect them. It also doesn’t explain why people lose weight when eating large amounts of certain types of caloric foods, while strictly avoiding others. In addition, it is simply not enough to say to a person, “Eat less and exercise more,” because, unless they have been living on Mars and didn’t know about calories, if they could have done that, they probably would have. What factors affect food intake and your diet plan? The amount and type of food you eat is affected by your physiology, environment, culture, upbringing and even your perception of yourself and the foods you eat. The most obvious component of food intake is hunger. This is your body’s way of signaling to you that it is ready for more nutrition in the form of food. Physiological hunger may be affected by a number of factors, including an empty stomach, the presence or lack of nutrients in your bloodstream, hormones, metabolism and even illness. Interesting fact about Diet Plan: Many women will tell you that they are always hungrier during PMS. This is probably due to a hormonal imbalance. Women will tell you that it’s like a switch that turns on and you feel like you want to eat anything and everything (particularly if it’s chocolate or other sweets). Then the switch turns off again and you are back to your normal, sensible self and wondering what possessed you to stock up on chocolate-covered graham crackers last week! Then there is appetite. Although appetite and hunger may go hand in hand, it is often the case that we mistake mere appetite for physiological hunger. For instance, you are watching your favorite television program and a commercial comes on showing a close up of a pizza, dripping with cheese. Your response is to realize that you are “hungry” and you immediately phone for pizza delivery, or you settle for a close approximation. For some people, just watching television, particularly a certain type of program such as a sporting event or a movie, will trigger the appetite in the form of the urge to snack. Emotions may play a large part in your food intake. One movie star who is known for her attractive figure says that her secret is that she can never eat when she is nervous, and since she always gets nervous when she is acting, she does not have a problem with overeating. On the other hand, another actress says she tends to eat more when she is nervous. Some people have the urge to eat in response to any emotion--anger, joy, sadness, or frustration--while others are unable to eat when in the throes of any strong emotion. To make matters worse, those who eat in response to emotion may choose so-called “comfort foods” which are generally high in calories. Even the time of day can affect your appetite. “It’s noon; time for lunch!” Regardless of whether you are physiologically hungry, your appetite kicks in due to the clock telling you it’s time to eat. In addition, your schedule may only allow you to eat during the proscribed lunch hour, so you eat, even though you are not hungry, to avoid the potential that true hunger will come later when you can’t satisfy it. 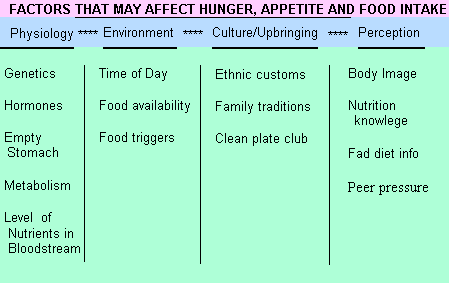 Social gatherings, especially in certain families and cultures, often revolve around food, regardless of hunger. What is a birthday party without birthday cake, or any party without snacks? Eating and drinking-- especially eating and drinking special party foods-- is generally part of the fun and expectation of getting together. Sunday dinner with grandma and grandpa is a tradition in many families, and what would it be without fried chicken, mashed potatoes, gravy, buttered rolls and apple pie for dessert. The day and the type of food may change according to family custom or cultural tradition, but the affect on food intake is undeniable. Believe it or not, there are many of us that grew up as members of the “Clean Plate Club.” This means that we were raised to believe that we must finish whatever food is on our plate, because children in some far off country were starving. Now that we are adults, a clean plate does not have to be a problem if we are careful about how much food we put on it in the first place. Interesting Fact about diet plan for weight loss: There is a part of your brain called the hypothalamus that controls such things as appetite and cravings. When you are full, this part of your brain signals and, if you are listening, you will stop eating. Some scientists say that it takes about 20 minutes from the time you start eating for the realization to reach your brain, so if you eat your entire meal in 15 minutes there could be a delayed reaction! Oops! Another influence on food intake is the information you may have heard related to fad diets or weight loss plans. For instance, those hearing about the Morning Banana Diet may perceive that bananas are a “diet food” and add them to their weight loss strategy. During the height of the “low-carb” diet craze, any carbohydrate was often vilified and considered taboo. These attitudes can stay with you and affect your food choices long after the particular diet plan has been abandoned. On the positive side, some of the information connected to weight loss plans is useful. For instance, if you learned from your low-carb diet plan the difference between simple and complex carbs, you may continue to make better carb choices even if you abandon the strict regimen of the plan. For more about carbs, click on this link to the Carbohydrates page. Fun Fact about diet plan for weight loss: Recent studies have shown that people who write down everything they eat tend to be more successful with weight loss. of course, this only works if you are honest with yourself about what and how much you eat. I used to manage a women’s fitness center, and as part of the program the ladies were supposed to keep a food list. You would be surprised at the number of pleasingly plump ladies who could survive for weeks on a few carrot sticks and low-fat cottage cheese and still gain weight! The foods you choose to eat have a great deal to do with how satisfied you will feel and for how long. It is generally agreed that protein foods are the most satisfying in terms of making you feel like you are not hungry anymore. Bulky Carbohydrate foods, such as fruits, vegetables and whole grains, will fill up your stomach faster causing you to feel full sooner. Foods that are high in Fat, will not instantly satisfy, but will curb hunger later as they slowly move through digestion. This is one of the advantages of including small amounts of healthy fats in your diet, since they keep away hunger longer by slowing down digestion. The disadvantage of eating high fat foods is that you can eat a lot of high calorie fat before you will feel full. By combining all of the food groups, you will be more likely to satisfy your hunger without eating too many calories. Each type of energy food--Protein, Fats, and Carbohydrates--has a different function in satisfying your hunger. Remember that the energy balance equation has another part besides Food Intake. The second part is Energy Output. There are probably three factors that go into your total energy output. Can you guess what they are? First, there is the energy it takes just to be alive—that is the energy you use to breathe, to keep your organs functioning and for all the processes that go on inside you as you go about your day and even when you sleep. This basic energy expenditure is called your basal metabolism. Believe it or not, this is normally the largest use of energy for the average person-about 50-60%. This means that you generally use half or more of the calories you eat just to be alive! The basal metabolic rate (BMR) or rate of energy used for metabolism is different for each person and changes as various factors change. The rate that you use calories for basal metabolism can be affected by age, the amount of muscle you have, the temperature in the room, if you are ill, if you smoke and even how tall you are. Second, there is the energy you use during activities such as walking, running, or any other movement of your body. This can comprise one-third to one-half of your total energy expenditure. Third, there is the energy expended by just eating. When you eat and your digestion kicks into gear, this process uses extra energy beyond your basal metabolic rate. This effect only accounts for about 10% of energy use. BMI = [Your weight in pounds x 703] divided by [Your height in inches, squared]. It is generally considered healthy to have a BMI between 18.5 and 24.9. If your BMI is below 18.5, you would be considered underweight and if your BMI is above 25 you are considered overweight. A BMI of 30 and above is considered obese. Notice that in the above example, the person with a BMI of 24 would fall into the “healthy” range. While this system of determining BMI may be useful, it does not take into account body composition, which is the proportion of fat, muscle, bone and other tissue in your body. Since muscle weighs more than fat, if you are an athlete with a lot of muscle and very little fat, your BMI may fall in the “obese” range, even though you are in great shape and not over fat. Fun Fact about diet plan for weight loss: These differences in body composition explain why two people who are the same height and weight may look completely different. If one person has a lower body fat percentage, he or she will look slimmer than a person of the same height and weight with a higher percentage of fat. How trim is your waistline? Another way to assess whether a person is at risk due to excess weight is to measure the waist circumference. To do this, take a tape and measure the spot just above the hipbones, pulling the tape tight but not causing indentation. If you are a woman and this measurement is greater than 35 inches, or if you are a man and this measurement is greater than 40 inches, you are at a higher risk of adverse affects to your health due to your weight, such as Type II Diabetes and Heart Disease. Excess belly fat seems to indicate a greater risk to your health than excess fat on other parts of the body. Another way of saying this is that it is better, in terms of your health, to be pear-shaped than apple-shaped. This may be because every bit of fat that you can see around your waist is an indication that more fat has collected around your vital organs such as the heart. Diet Plan for you. What’s a person to do? So, you’ve figured out your BMI and it’s in the overweight or obese range. Of course, you didn’t need to do the math to know what your mirror had already told you. However, keep in mind that your goal should never be to emulate some airbrushed, ectomorph you’ve seen on a magazine cover or on television. Your goal should always be to look and feel healthy and to be at a realistic weight for you. Also, there is significant medical evidence that it is better to be slightly overweight than to be constantly yo-yo-ing up and down. Weight loss and being healthy in general is a matter of taking care of your whole self--body, mind and spirit. With that in mind, and without recommending any specific weight loss plan, here are some tips that may help. A good diet plan includes taking care of your body. -Get a physical check-up to make sure there are no underlying health problems, and discuss with your doctor your plans to lose weight. This is particularly important if you are planning any drastic changes or if you have a lot of weight to lose. Your doctor will check your heart, blood pressure, blood sugar, blood lipids, and can advise about your general health. 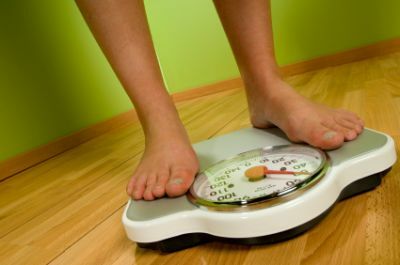 He can also help you to make sure that your weight is not connected to any disorder such as Cushing’s Disease or Hypothyroidism. -Don’t “go on a diet”; instead, make a lifestyle change. If the plan you are contemplating is too drastic to stay on for a lifetime, it is not a good choice for permanent weight loss. -Set a realistic goal for yourself. Consider all the factors that contribute to who you are, including heredity, body type, lifestyle, age, gender and occupation, and assess what is desirable and possible for you in terms of weight.Accept yourself and be practical in the goal that you want to achieve with regard to a healthy weight. On the other hand, be honest about what you need to do to be healthy. Find a balance between the status quo and looking like an 18-year-old fashion model. -Educate yourself about food. Find out all you can, so that you can make informed choices. Make sure that your information comes from sources that have your best interests at heart, and not from a source that has a financial interest in your thinking and behaving a certain way. -Avoid single food plans and plans that eliminate certain food groups. A balanced and satisfying diet that you can enjoy for a lifetime includes all of the major food groups—Protein, Fats, Carbohydrates, Vitamins, Minerals and Water. It is generally recommended that you balance Carbohydrates, Protein and Fats in a 40%-30%-30% ratio respectively. This is not an exact requirement, just a general guideline. -Read labels and become label savvy. Know what’s in the foods you buy and eat. Even when you eat out you can stay informed, since restaurants (particularly fast-food ones)often have nutrient information available at the restaurant or on their website. You will need to invest some time at the beginning of the process, but soon you will be able to efficiently scan any label and glean the information you need to determine if the product is right for you. Also, be wary of claims made on the label that are designed to encourage you to buy the product, especially with regard to weight loss. For more information on food labels, click on this link. One “serving” of meat is about the size of a standard deck of playing cards. One cup of cooked vegetables or rice is about the size of a fist. A medium piece of whole fruit is a little bigger than a tennis ball. Also, find out how much food is equal to the “serving” listed on the food label. For example, if it says one-half cup is a serving, measure out a half a cup of the product into your dish so that in the future, you will know what a serving of that particular product looks like, even if you plan to eat more than one serving. -Be wary of “low-fat” foods. Be aware that, often, when the fat content is reduced in products such as yogurt, ice cream and baked products, it may be replaced by sugar or chemicals that are not necessarily better for you than the fat. Generally, it is the fat that contributes to the food's pleasing taste and texture. Thus, it may be better to eat smaller amounts of the whole food, rather than a version that has been modified in an unhealthy way. Of course, this does not apply to products, such as milk, that merely have the fat removed, without replacing it with anything unhealthy. -Slow and steady wins the race. Give yourself time to lose weight slowly.Set short-term goals for yourself. In this way, you can maintain your nutrient status, your muscle and skin tone, and you will feel happier, less deprived and be more likely to succeed.If you try to lose weight too fast, your body will be forced to use muscle tissue for its needs instead of fat, which is counterproductive to what you are trying to do. Even if you only lose a half a pound a week, at the end of a year you will have lost 26 pounds, versus if you had failed or done nothing and found yourself the same weight or even heavier. Most health experts recommend that you keep your weight loss to no more than 2 pounds a week. It’s important to remember that at the beginning, you may lose more quickly, but then your weight loss may level out to a slower rate. -Don’t obsess about the number on the scale. Remember, your weight fluctuates naturally based on fluid levels in your body. The exact number isn’t as important as the fact that you are trending downward and that you are consistently making better food choices. Some experts recommend that you throw out the scale altogether, but if you are not comfortable with that, try not to let that number be all-powerful. As an alternative, take your measurements, or use the fit of a certain article or articles of clothing as your guide. Quite often they will tell you that, with their particular product plus a sensible diet and exercise, you will achieve amazing results! You might want to try the sensible diet and exercise first, to see if you can achieve the same results. -Include fiber-rich foods in your diet. These are foods like whole grains, fruits, vegetables, legumes and nuts and seeds. Fiber will help you to feel full and will facilitate the efficient movement of food through your digestive system. For more information on fiber, click on this link. -Drink water. Water is necessary to so many processes in your body, including the breakdown and elimination of stored fat. Whenever possible, replace other beverages with water and try to change your thinking to view water as the true thirst quencher. Most people would lose some extra pounds by simply replacing soft drinks (including diet soda) with water. For more information on the role of water in good health click on this link. -Eat foods that you like and try to change your thinking to like foods that are healthy for you. There are so many wonderful, delicious and nutritious foods to choose from! If you feel deprived all the time, you will probably not be successful at weight loss. -Get enough sleep. Recently, scientists have found a correlation between sleep and weight loss. It is while you are sleeping that your body is able to take care of all those housecleaning duties that it can’t perform while it is busy keeping you going during the day. In addition, there seems to be a connection between adequate sleep and successful weight loss. Lack of sleep can have an effect on the hormones that control hunger and appetite. Perhaps, another reason for the correlation between a good night's sleep and weight loss, is that if you are rested, you will have the reserves to get through a busy day without relying on certain--usually caloric or chemical laden--foods or drinks for a pick-me-up. Although you can't always control the amount of sleep you get, as far as is within your power, make getting enough sleep a priority whenever possible. -Be flexible within limits. If you establish a rigid lifestyle, then you are more likely to fail. Include some flexibility in your diet and realize that we all need to feel some freedom in our choices in order for any plan to succeed long term. Generally, if a food is “forbidden”—especially a food that you love—you will find yourself feeling deprived or focusing on not eating that food. Try to make the best choices most of time while at the same time allowing for a little flexibility to make long-term success possible. -If you goof, don’t use it as an excuse to give up. Perfection is not required in order to succeed. (Did you know that most successful authors have had their books rejected many times before a publisher finally takes a chance on them?!) Just recommit to your new lifestyle and go on with what you were doing. A goof is only fatal if you allow it to be. -Incorporate some stretching along with other exercise into your life. This will increase the energy output side of the equation and, more importantly, improve your mood. Find something that you like to do and, if it helps, get a friend to do it with you. Some people function well with a programmed “workout,” while others will be happier if they are doing physical labor or participating in sports or group activity. Whatever it is, if it gets you moving, you will feel better and have more success with maintaining a lifestyle that supports a healthy weight. -A good diet plan includes taking care of your mind. If you are an emotional eater, that is if you eat when you are sad, bored, happy, or in the throes of any strong emotion, try to come up with alternative pleasures that you can substitute for eating at those times. These could be a warm bubble bath, a chat with a friend, a good book or a movie, a walk with your favorite pooch, a bike ride, a bit of time in the sun, making love, listening to music, playing music, or anything else that you enjoy, including helping others. If you can retrain your brain to trigger other pleasures besides food as a response to emotion, you will go a long way to changing the eating patterns that have caused you to be overweight. Keeping track of what you eat in a food journal. -Find ways to handle stress. Do deep breathing, spiritual activities, physical activities, and other stress management techniques to reduce the amount of stress in your life. You have probably heard that stress causes you to produce a hormone called cortisol that contributes to weight gain, especially around your middle, where it can be dangerous to your overall health. -Smile, laugh and think positively. There is a significant body of evidence that positive "self-speak" and attitudes can help you achieve your goals. Hang out with positive people and fill your life with positive messages whenever possible. Thinking of yourself as a happy and healthy person, can go a long way to helping you make healthy choices in your life. There is some thought that we often feed our hungry spirit with physical food rather than spiritual food. Whether or not this is true, truly miraculous things can happen when you access the power that God has made available to you. -A good diet plan includes taking care of your spirit by cultivating spiritual health. Don’t ignore the spiritual side of yourself or the impact that neglecting that part of you can have on your goals—including your goal to lose weight. -Spend time thinking about and helping others. There is no better way on earth to lift your spirit than to do something nice for someone else. If I knew the secret to easy, permanent weight loss that works for everyone, I would give it to you—free of charge. In fact, I would shout it from the rooftops! Having said that, I still believe it is possible to achieve a healthier weight by incorporating some, if not all, of the ideas listed above. In as few words as possible, you can do this by educating yourself about food, eating mostly fresh, whole foods, eating consciously--enjoying each mouthful, and bybalancing the needs of your mind, body and spirit. Now it’s up to you to implement a diet plan for permanent weight loss! Click here to go from Diet Plan for Weight Loss page to Best Weight Loss Plan page.